Extravaganza was Born in 1871 in Windermere, now Cumbira (then Lancashire), to William Tomkyns-Grafton and Kate Julia Grafton. She lived in Clifton, Bristol; Inslow, Devon and finally Boscombe, Dorset. Finding census records for her was made easier by all her middle names, as she did not use Extravaganza (can’t think why not) and mostly went by Muriel. Extravaganza is in a boarding school by the time she is 9, in 1881, and without paying for her birth records I had no name for her parents and so had a hard time finding them! Eventually I searched for just Grafton in Ulverston, where E’s birth record was, and found “Wm Tomkynor Grafton“. As E was very inconsiderate and born AFTER the 1871 census *tut* I wanted something else to make sure this was definitely her father, and, unfortunately, I found it. When E was just a few months old her Mother Kate filed for divorce. In the petition she cites beatings, and having water thrown over her in bed. However as the case goes on, more complaints are added, mostly (please skip the rest of this paragraph if you are of a sensitive nature!) of a sexual nature – he asking her to “pose naked before him” (this was soon after the birth of Extravaganza in September 1871), he also “attempted to place his private parts in the petitioner’s mouth” (this again was soon after E’s birth, and again in Birmingham 3 months later) and “attempted an unnatural act upon the petitioner on two separate occasions” (This whilst she was 7 months pregnant and 6 months after the birth). That he also “exhibited indecent prints in the presence of the petitioner” is also mentioned. His reply to her accusations is a page, (no fullstops) of accusations of temper, her throwing ornaments, candles, water and the contents of a chamber pot at him; breaking open his drawers, burning his letters and papers, broken furniture and windows, insulting him in front of the servants and encouraging them to disregard his orders, threatening to burn his (note HIS not THEIR) house down, calling him names (boohoo), striking him with a switch and a whip, threatening him with a knife and poker (find it odd how he brings this up AFTER the name calling?!) and biting his lip so it makes it bleed, and that if on occasion he has used violence or harsh language against the petitioner it has been justified and provoked by her conduct. Her response is a simple one lined denial. He also states he wants her to renew his conjugal rights, this is then crossed out and amended to asking she “deliver up the child” – Extravaganza Muriel Maud, and this is (sadly) granted to him, when she is just 14 months old. Of course we don’t really know who was in the right here, it seems William had ideas that Kate wasn’t a fan of, and that led to some heated arguments. However I DO think that he implicitly admits to beating her, and no servant would go against their ‘master’ if they didn’t think he deserved it! So poor little Extravaganza has not had the best of starts!!! I would like to note that I still have not come across any reason for her being called Extravaganza – I half expected it to be one of the reasons used in the divorce petition “And he made me call our child Extravaganza!” But no such luck. So at this point it’s all still speculation! In the divorce records it’s also mentioned that her father William has two other children – with no clue of their names or his ex wife’s as well as finding out on William’s will his name was Tomkyns at birth not Grafton (at this point not expecting him to have taken his wife’s name – strange that he should take it and also his next wife should take it too!) it was hard to find him, so a newspaper search for Tomkyns-Grafton found a death for a W F Vivian Tompkyns-Grafton and a C J Tomkyns-Grafton in a dog show (!) – I then searched ancestry for these names and found them lodging with their governess (!) Ellen cox in 1871, and also with their Grandmother, Jane Grafton in 1881. Here she is living in Cheltenham, but in 1871 she was living just a mile from Clifton College… Perhaps this is where William had heard of the school he later sent his daughter to. Looking back through Jane Grafton’s censuses, one daughter matched age and birth place, and name, of a Martha Tomkyns married to William Tomkyns that I had found for 1861. What’s stranger here is why he would not have taken her name immediately, but seemingly after the birth of children or even her death, unfortunately I will never know for sure when exactly it was. This was good though, as I had already found this William’s parents were William Tomkyns esq and Jane Thomasine Benny Serjeant, of Devon. 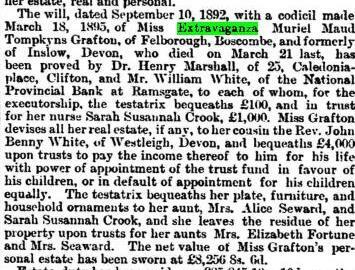 And in Extravaganza’s more detailed Will in the newspaper, she leaves some money to her cousin Rev. John Benny White of Devon – of course this warrants some more investigation to be proved but it would be an odd coincidence considering all the other evidence! She leaves the majority of cash – £1,000, or £60,000 in today’s money – to Sarah Crook, who was her “Sick Nurse” from at least 1891, where E is living with the Vicar of Olveston (NOT Ulverston, where her sister lives, this got confusing for a minute). A long illness such as this would have to be something like Tuberculosis or cancer, and I wondered if the codicil that was made 3 days before her death was to include Sarah crook? The rest is self explanatory, although I realised when cropping the picture that I had missed something – she has moved down to Boscombe in Bournemouth – to a house named Felborough! I decided to order her death certificate and found that she lived in Campbell Road, but there is no house there called ‘Felborough’ now. However I did find out that her illness was indeed Tuberculosis, with ‘”5 years” written next to it. There is much more I could say that is purely supposition in terms of closeness to her family and how much she knew of her parents tumultuous relationship, but then it’s so hard to know what someone thought or did when all you have is a snapshot every decade of, in this case, a very short life of 23 years. As an aside Sarah Crook had a happily ever after – she married a Dairy manager one month after E’s death, and they named their first daughter Muriel, the middle name she would have known Extravaganza by.